On Sale December 3rd 2018! Call the Customer Service Center at (512) 389-8900 to purchase ornaments. Ornaments are $8.95 each, or $19.95 for the set of three. Purchase a Texas State Park gift card valued at $75 or more during December, and receive a FREE 2018 ornament. Tax and shipping fees apply. The 2018, limited-edition, ornaments feature the frontier-era hospital of Fort Richardson State Park, the namesake flora of Palmetto State Park, and surfing the dunes at Monahans Sandhills State Park. Ornaments arrive in a gift box. All wooden ornaments measure roughly 3.5 by 4.75 inches. Due to their handcrafted nature, color and contrast will vary slightly so that every ornament is unique. These ornaments are handcrafted in the United States, with images laser-etched into wood in incredible detail. A short educational message is burned into the back of each ornament. Follow Texas State Parks Social Media outlets throughout December to learn how you can win ornaments as prizes! Rules and Limitations apply. 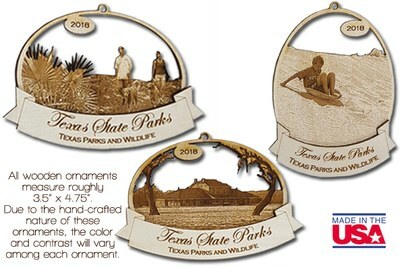 Revenue from the sale of ornaments directly supports the mission of the Texas State Park system. The Texas State Park ornament program began in 2002 to celebrate the diversity and beauty of the Texas State Park System. Each ornament features the natural, cultural and historical resources that the Texas Parks and Wildlife Department protects. You'll find images of building, wildlife, plants, and some of the many outdoor activities that you can enjoy at the more than state parks and historic sites across Texas. Visit our Ornament Collection Page to see every State Park ornament, and to check purchase availability.